Silver Ion Compounds were identified for their disinfectant properties for thousands of years. It has been used as a disinfectant for water storage for many years in many locations around the world. Over the last decade, Silver has been developed as a disinfectant for the healthcare industry. It usually is formulated with citric acid and though it has a low toxicity and is not corrosive to skin it can be an irritant to eyes. It has not been known to cause respiratory sensitivity. It can carry a kill time rating between 1 – 5 minutes. Though not registered to kill TB, it is effective against MRSA, Norovirus, Gram negative and positive bacteria, HIV & HBV. Due to the nature of its active ingredient, it can be more expensive than most other disinfectants on the market. “Comprehensive reviews of antisepsis 759, disinfection 421, and anti-infective chemotherapy 760 barely mention the antimicrobial activity of heavy metals 761, 762. Nevertheless, the anti-infective activity of some heavy metals has been known since antiquity. Heavy metals such as silver have been used for prophylaxis of conjunctivitis of the newborn, topical therapy for burn wounds, and bonding to indwelling catheters, and the use of heavy metals as antiseptics or disinfectants is again being explored 763. Inactivation of bacteria on stainless steel surfaces by zeolite ceramic coatings containing silver and zinc ions has also been demonstrated 764, 765. 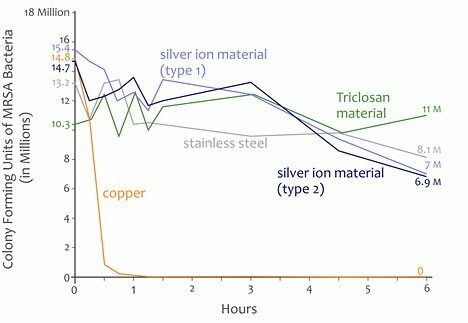 Metals such as silver, iron, and copper could be used for environmental control, disinfection of water, or reusable medical devices or incorporated into medical devices (e.g., intravascular catheters) 400, 761-763, 766-770. A comparative evaluation of six disinfectant formulations for residual antimicrobial activity demonstrated that only the silver disinfectant demonstrated significant residual activity against S. aureus and P. aeruginosa 763. Preliminary data suggest metals are effective against a wide variety of microorganisms. A study was performed on the efficacy of Copper as a disinfectant against various strains of bacteria. The following results for MRSA show its effectiveness. Copper is also effective against Staphylococcus aureus, Enterobacter aerogenes, Pseudomonas aeruginosa, and E. coli. A study performed from July 12, 2010 to June 14, 2011 at the three medical centers including the Medical University of South Carolina, the Memorial Sloan-Kettering Cancer Center, and the Ralph H. Johnson Veterans Affairs Medical Center. Patients who were admitted to the ICU of these hospitals were randomly assigned to receive care in a traditional patient room or in a room where items such as bed rails, tables, IV poles, and nurse’s call buttons were made solely from copper-based metals. Both traditional patient rooms and rooms with copper surfaces at each institution were cleaned using the same practices. The proportion of patients who developed HAI and/or colonization with MRSA or VRE was lower among patients in rooms with copper surfaces (7.1%) compared with patients in traditional rooms (12.3%). The proportion of patients developing HAI was lower among those placed in rooms with copper (3.4%) compared with those in traditional rooms (8.1%). One of the hurdles to get over with putting copper in a healthcare care facility is the idea that it is too expensive. The number of copper or alloy antimicrobial healthcare products has significantly increased since the EPA registration in 2008. Currently, there are more than a dozen manufacturers in the U.S. and around the world using antimicrobial copper alloys to produce bedrails, handrails, door handles, grab bars, IV poles, trays and carts, sinks and faucets, computer keyboards, and face plates. More than 450 antimicrobial copper alloys are available, with colors ranging from red to yellow to silvery-gray. The color and tarnishing properties are dependent on the alloy mixture. Those with higher percentages of nickel more closely resemble the silver tone of stainless steel and do not tarnish.